This is so easy that I was almost embarrassed to make it a post! You only equipment needed is one skillet about 2" deep for this one. That is IT! This is my attempt to empty your pantry of canned produce. 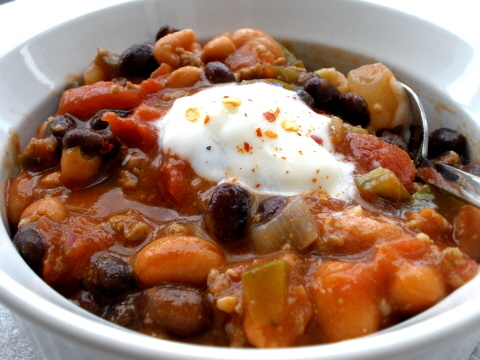 So enjoy Chili on this chilly winter day. So funny aren't I? Seriously, I need to get out a bit more. Over medium heat add EVOO to a medium skillet. Once EVOO is hot add garlic, green pepper, onion, and ground beef and continue to cook until meat is browned through. Then add cumin, pinto beans, black beans, stewed tomatoes (break up with spatula), tomato sauce, and all the hot stuff you can handle. Allow to cook until heated through and flavors combine, about 20 minutes. Garnish and dig in. Serve with grilled cheese for an especially great taste sensation. To modify for a vegan dish, skip the beef and cheddar garnish, and serve over quinoa for extra protein.